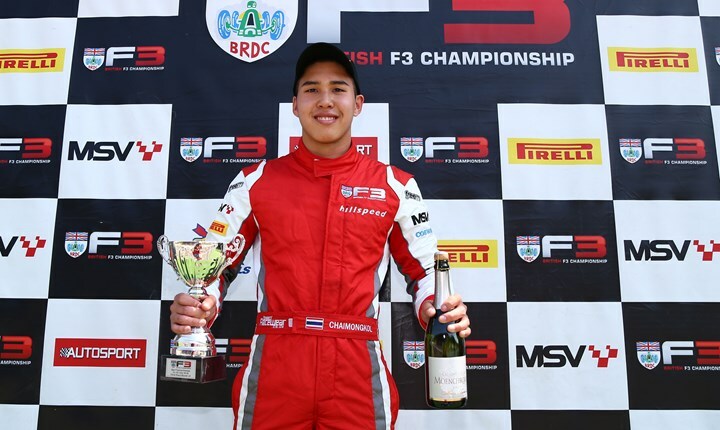 Multiple podium finisher Sasakorn 'Cutter' Chaimongkol has been confirmed as Hillspeed's first signing for the 2019 BRDC British Formula 3 Championship, with the Derbyshire squad elated to retain the exciting Thai racer to spearhead its assault for the new campaign. Chaimongkol, who ended his maiden season in Formula 3 as the top 'Rookie' driver last year, and a very strong ninth in the overall championship with the Hathersage team, is relishing being back for his sophomore season in the highly competitive category. His return is backed by a new international sponsor for 2019, which is set to be revealed in March. Having progressed through Hillspeed's successful driver development programme, first joining the squad a couple of years ago with a structured testing schedule prior to his race debut in the 2016 BRDC British F3 Autumn Trophy, the 20-year-old has established himself as a very promising talent. Along with impressing as the top 'Rookie' last year in his first full season of car racing, Chaimongkol took two outright podium finishes, including a sensational season-best second position at the legendary Spa-Francorchamps in Belgium during round 14. Notably, highlighting the Thai's consistency on track and Hillspeed's strong reliability, Chaimongkol scored points in each of the 23 races contested in 2018 and it is that partnership which should shine very brightly during the coming season. "We are absolutely delighted Cutter is remaining a Hillspeed driver for his second season in British F3 and we're all confident he can be a consistently strong front-runner this year," said team principal Richard Ollerenshaw. "He's become an integral part of the Hillspeed family over the last few years, since first beginning a testing programme with us in 2016, and his progression has been outstanding. "British F3 is, undoubtedly, one of the strongest domestic F3 championships on the globe and with the great continuity MSV has ensured is in place, retaining the same car and regulations for 2019, we're looking forward to an enjoyable, and hopefully successful, season with Cutter. Last year was a strong one for Hillspeed with the top two rookie drivers, and we're determined to build on that." Looking ahead to his sophomore year in British F3, the Thai racer said: "I'm really happy to be back in British F3 this year and especially with the Hillspeed guys, it's a fantastic team and we have a very strong relationship which has been built over the last few years. "British F3 is a great championship with very close racing, some fantastic circuits which help young drivers to really learn the skills they need for the future, and I think with the continuity we have for the new season we should be in a strong position. Last year was great, especially the podiums at Snetterton and Spa, and we plan on taking many more of those this season." Hillspeed is in discussion with drivers for the squad's two remaining seats in British F3 but also welcomes additional interest. To find out more, contact Richard Ollerenshaw on 07966 650400 or by email to info@hillspeed.co.uk. For more information on the BRDC British F3 Championship, click here to visit the official championship website.